For many people working in the business of developing and selling residential land, they’re hoping that 2009 is the year that buyers and sellers will finally be able to agree on a price and thus plan ahead for an eventual rebound. To be sure, the year 2008 was a terrible year to be in the land business: according to Real Capital Analytics in New York, the dollar volume of land sales in 2008 was just a fraction of the $37.07 billion reported in 2007. One major reason for the sharp drop-off in activity – estimated at 75% through August of 2008 versus the same period of 2007 – was that buyers and sellers were not able agree on prices and terms. At the same time, potential buyers such as land developers, builders and hedge funds remained in ‘wait-and-see’ mode as they devoted most of their energy to simply holding onto what they already had. Moreover, since many land sellers in 2008 were home builders looking to book losses before the end of the year in order to carry back tax losses for 2007 and 2006, objective price discovery became impossible when companies such as Lennar and D.R. Horton were getting rid of land holdings for as low as 25 cents on the dollar. Finally, with private capital hibernating, the few buyers out there with the capital to invest are looking to invest for long-term gains and are thus unusually patient to find the best deals. That patience may be about to pay off. 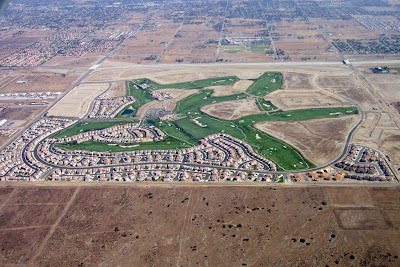 According to Erik Christianson at The Hoffman Company in Irvine, California, land values for a standard 7,200-square-foot finished lot in the high desert of Los Angeles County, the low desert of Riverside County and various submarkets of the Inland Empire have fallen from 55% to 70% since the market last peaked in the fourth quarter of 2005. Similar declines have been reported in other sun belt markets such as Phoenix and Las Vegas. With raw land selling for close to its value for agricultural uses, the best potential deals today are for finished lots, entitled lots that are not yet improved and even standing inventory of home builders cut off by their lenders. Moving into 2009, some brokers think that values have fallen almost low enough to capture the interest of not just the usual suspects, but vulture funds armed with nine-figure war chests set up especially by land development veterans to pounce at the right time. But for inexperienced hedge funds and private equity companies located far from where the land is located, they often must outsource their due diligence, purchase decisions and the development of their land portfolios to others. For them, the term ‘caveat emptor’ has rarely been more true. For example, argues Les Whittlesea of Whittlesea-Doyle, which specializes in Southern California’s Inland Empire, a fund which insists it is only interested in larger parcels including 500 or more lots could easily miss better opportunities with fewer lots that are located closer to existing jobs and city infrastructure. Consequently, when the market rebound does happen, it will likely favor certain submarkets over others, but only a thorough analysis will separate the winners from the laggards. Instead of finding the deals first and then conducting the analysis, it might be smarter for buyers to first rank a region’s submarkets before falling in love with a specific parcel and then having to justify it with economic smoke and mirrors. After all, sometimes the best opportunities come in smaller packages, but you wouldn’t know it unless you have your own – and objective -- guides to show you the way. I speak with a lot of potential buyers (land developers with cash), and there is a surprisingly high level of agreement of value among potential buyers. It is the sellers who have not accepted reality yet. The bid/ask spreads are very high, and sellers are either in denial, or they don't have to sell. Land values depend on house values, and those are still falling. The bid/ask spreads are going to increase until sellers capitulate. Look for the banks to capitulate first. Thanks for the article. I've heard more and more of my friends talk about investing in land to diversify their portfolio. While researching I actually came across a community that is selling land/luxury home sites that peaked my interest. It could very well turn into a prime piece of Scottsdale, Arizona real estate. The community is called Sereno Canyon. What's really going on with the economy? Obama's mortgage plan: is it fair to taxpayers? Is it time to just nationalize the banks already? Will home prices fall too low in the short run? Will the Obama housing plan work? Be glad you're not facing foreclosure in Dubai! Housing prices to bottom in 4Q 2009?